The counseling office is a part of Sunlight Farm, a unique place where people are touched by the beauty of the earth, feel connected to the healing presence of nature, and find a serene place to work on the counseling process. The charming century farmhouse serves as a confidential setting where people can relax from the demands of life and talk about their concerns in a private setting. The counseling office is located in the center of rural Ashtabula County, 10 miles from Lake Erie. 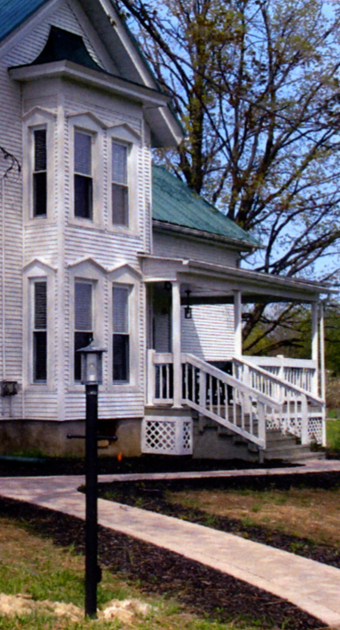 The farmhouse office is situated on 36.5 acres of land surrounded by either soy or corn fields, trees and flowers, two ponds, wild life, and a majestic oak tree that is some 200 years old. This setting is ideal for those who relate to nature and are calmed by the quietness of the country. Sunlight Farm is easily accessible from the Route 45 exit off Interstate 90, the Route 193 Kingsville exit or from Route 11 at the Route 167 Jefferson or Seven Hills exits. Please Note: Sunlight Farm is located on Brown Road in Sheffield Township (Jefferson zip code 44047). A mile to the north, the road is called Plymouth-Brown Road. Also, Sunlight Farm's Brown Road location should not be confused with another Brown Road located in Geneva.